Perennial crop production (grains, oilseeds, pulses) is an emerging field of research in North America. Some of the research on perennial cereal grain is taking place right here in Alberta at one of the province’s oldest agriculture research stations. We are giving you an opportunity to see it for yourself. 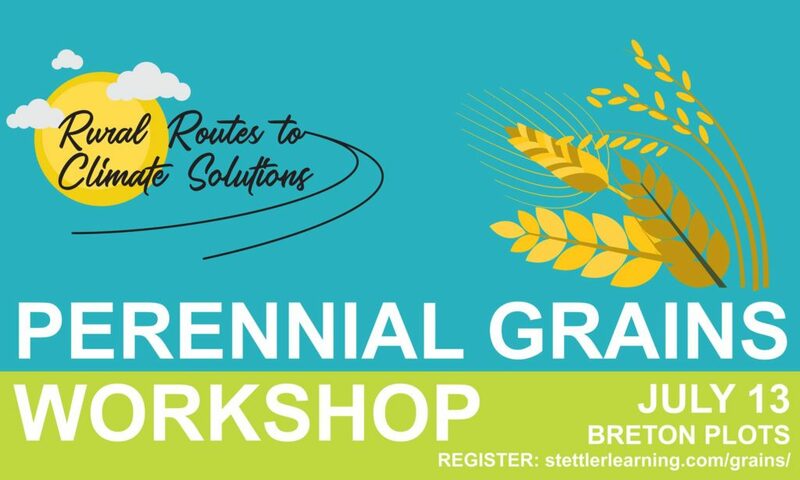 Join Rural Routes to Climate Solutions for an unique chance to speak with and learn from the University of Alberta researchers who are working on perennial grain research at Breton Plots. The research team at Breton Plots is VERY excited to share their work and exchange knowledge with producers. Learn what to expect in terms of yields with perennial grain. Find out what the existing and developing markets are for the crop. Discover how perennial grain production requires minimal spraying and no tillage and helps keep soil healthy and productive. There are very few spots in Alberta you can see perennial cereal grain in action. You don’t want to miss this one.